Phoenix’s story is as astonishing as it is moving. March 6, 2008, Mississippi State University’s student team, dubbed the “Fix ‘em Team,” was winding up its day of spaying and neutering at IDA's Project Hope Sanctuary. Under the leadership and guidance of Dr. Phil Bushby, Professor of Animal Health and Ethics, third-year veterinary students receive training and experience in surgery through spaying and neutering animals in shelters. Occasionally, they perform other surgeries as well. The MSU team was completing its sanitation of surgery tables and cages, and the Project Hope staff was unloading the last of the dogs and cats to be returned to their recovery quarters when Project Hope supporter Cecil Kirk whipped his jeep in behind the mobile spay unit. As he opened the rear door a long-lashed puppy who looked as if she’d been rolled by a vehicle peered back at curious eyes. 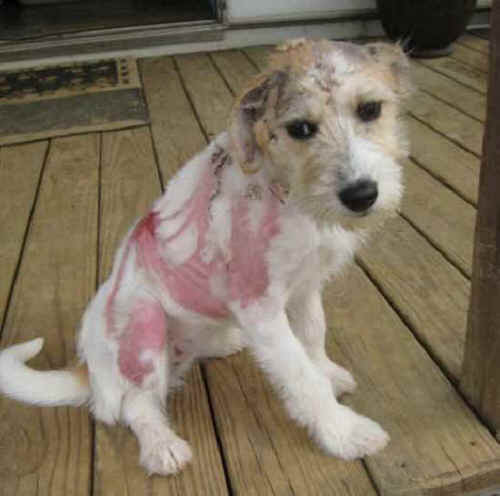 It appeared that this little precious pup, so perilously close to death, had severe road burn. Mr. Kirk thought she’d been attacked by coyotes. The little dog was rushed into the mobile unit, and Dr. Bushby went right to work on her. After shaving her just a bit he announced that it wasn’t road burn she suffered from. She’d been scaled. Within minutes her wounds were fully exposed. Boiling water had been poured on her head, rolling and swirling around her ears and down her back and around her sides. Dr. Bushby finished shaving away the hair around the burned area and removed hanging and decaying skin. This little girl had suffered her torture perhaps days earlier. How she’d survived the initial injury and shock is astounding. Infection hadn’t even set in. Project Hope Director Doll Stanley, who conferred upon the young dog the inspiring name of Phoenix, would care for her throughout her unbearable ordeal, recovery, and adoption. Phoenix’s first night was ghastly. Even with a pain reliever she moaned and whined the entire night in great distress. As Phoenix’s horribly burned body healed, the skin surrounding the deeper burns began to pull. Any little bump evoked a cry. This little innocent being had been scaled, transported, and then dumped on a rural road with few residences. It was quickly established that she wasn’t the companion of any of the residents. The sanctuary’s mother organization, In Defense of Animals, offered a reward for information leading to the arrest and conviction of the person or persons responsible for the torture of Phoenix. The perpetrator hasn’t yet been discovered. When young perpetrators act out their disrespect for life they usually brag. Vengeful adults who act in fits of aggravated anger are usually wise to the need for relishing their satisfaction in silence. When IDA members and the public learned of the dastardly torture of Phoenix adoption offers poured in. Phoenix would need an understanding guardian with patience for a little mischief-maker. Phoenix the prankster delighted getting into things, hiding things, chewing, and skirmishing with the “Grazer pack.” The “grazers” are the dogs with disabilities and personalities that prohibit them from sharing communal quarters with other matched dog groupings, but they share a special bond, and mischief is their game. Phoenix also loved hitting the smaller pond first thing every morning (where it’s suspected she drowned Doll’s expensive new prescription glasses), the pasture pond while the staff fed the horses, and later wandered to the secluded greater pond by afternoon. As both P.H. staff and the Grazers were mad about Phoenix there was no rush to place her. Doll wanted to wait until her image as an abused animal faded. She wanted Phoenix to be loved for who Phoenix is at heart: the vivacious, comic imp with the Disney character lashes. The smart self-willed champion of survival. And then it happened. Amy White, founder of the MSU “Homeward Bound” student group, called to say a perfect family had been found for Phoenix. The Project Hope staff, though sobbing, exulted in Phoenix’s chance to begin life anew. Phoenix sleeps on his new guardian Glen’s bed, along with Seamus, Glen's other dog. Gone is the shy, demure well-behaved little girl (at least initially), and soon replaced with the real Phoenix, mischievous, tough, and very loving. She's been to the vet, the groomers, been skunked at close range, back to the groomers, many family functions, and rides with Seamus and Glen on errands. Everyone loves her. She goes to the beach and gets to run around off-leash, ventures forth into 80 acres of woods and, on a really forlorn day, only gets leash-walked for about six to ten miles through exquisite ocean side parks. She is friendly with the two rescued cats in the house and possesses loads of toys piled so high that you can barely see the living room floor. She has lots of company because Glen is self-employed and works from home. Seamus and she are inseparable - they often sleep together and play nonstop. A happy, wonderful ending for the little dog left to die on a road, alone, maliciously burned. Now Phoenix is reveling in everything she loves. For more information about companion animal abuse, visit Pet-Abuse.com.